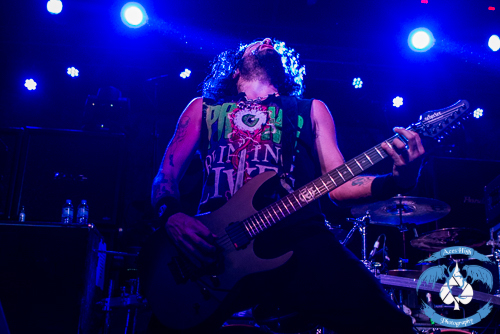 OVERKILL And PRONG Live in Cleveland, OH With Photos! I arrived at the good ol’ Cleveland Agora Ballroom Monday night for some east-coast thrash therapy. What better way to cap off a stressful Monday at work? OVERKILL was in town supporting their recent release, White Devil Armory. The album has become their highest-charting record ever; cracking the top 40 at #31. OVERKILL has been a mainstay; a sort of baseline, if you will, of thrash metal for a long time now. Since 1985 they seem to drop an album every 2-3 years that instantly becomes a classic amongst their stable of neck-wrecking fans. That’s why I think that OVERKILL are one of the most underrated groups in the genre. 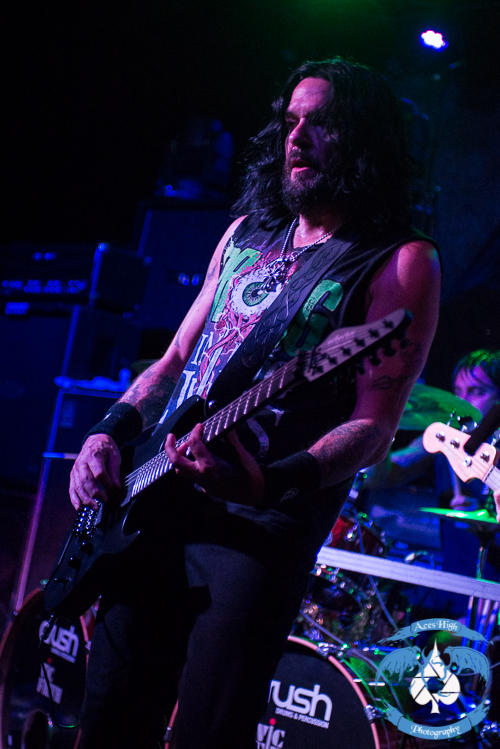 Supporting OVERKILL on the bill was PRONG. Before tonight, the extent of my experience with PRONG was limited to the hits “Revenge…Best Served Cold” and “Snap Your Fingers, Snap Your Neck”, which seem to be in perpetual rotation on KNAC.COM. I was really surprised by their energy and how tight they were. Guitarist/Vocalist and founding member Tommy Victor really grabbed the crowd’s attention. He would come out from behind the microphone to center stage and play to the fans. Bassist Jason Christopher and drummer Art Cruz rounded out the trio. PRONG pumped through an intense set including the aforementioned hits and a new single, “Turnover”, that really caught my ear. It was an excellent set that has compelled me to take a closer look at their catalogue. During the set change I was able to get the attention of one of the security guys to pry about getting up in front of the barricade to photograph OVERKILL. Normally there is no barricade in the ballroom at the Agora, but I was told that someone’s tour manager requested it. The make-shift barricade was held in place by a few 2x4s and its strength was questionable at best. At any rate, I got the ‘all-clear’ to move up front for the first 2 songs to get my shots. That was such a relief because by this point the audience had really packed it in. There wasn’t a bare spot on the entire floor and the crowd spilled up the stairs and out the doors. Seeing all of my extended metal family and friends packing it in on a Monday night in Cleveland almost made me shed a tear, Almost. 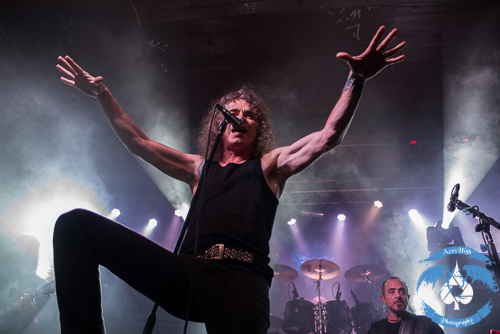 OVERKILL was very receptive to the raucous crowd as they hit the stage with the first single off of White Devil Armory, “Armorist”. OVERKILL spared no expense on the lighting package or drum riser. The setup looked like it was built for a larger venue. Although the ballroom is a smallish club, we fans got the large venue treatment. The blinding strobes, fog machines, backdrop, and stacks of Randall cabinets really set up the atmosphere for an excellent show. OVERKILL made their way through a well-balanced set of old and new material that included such surprises as “Black Daze” and “End Of The Line”, alongside the staples “Rotten To The Core”, “Hello From The Gutter” and “Elimination”. The band really looked like they were all having fun up there. Vocalist Bobby “Blitz” Ellsworth couldn’t keep from smiling. Guitarist Dave Linsk fed off of the crowd as he blazed through solos and Derek Tailer and DD Verni were very active all across the stage. Hats off to drummer Ron Lipnicki who never really had much of chance to catch his breath from the onset. I mentioned before about OVERKILL being underrated; the same can be said about Ron, specifically, who is an absolute beast behind the kit. What a great night for metal. OVERKILL are masters of their craft and proved once again that they belong in the discussion along with the ‘Big 4’. If this tour is hitting your town, it is a must see.